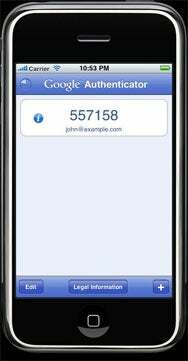 Google Authenticator is an application for smartphones that enables two-factor authentication for signing in to Google Apps accounts. Apple has now approved the iPhone version of the app. Two-factor authentication typically relies on something the user knows, such as a password, and something they have, such as a smartcard, security token or—in Google’s case—a mobile phone. The authentication process is based on an open standard for authenticating devices and networks called OATH—not to be confused with Oauth, another open authentication protocol aimed primarily at Web applications. OATH supporters include VeriSign, Sandisk and a number of smartcard manufacturers. Administrators can enable Google’s new authentication function for users of the Premium, Education and Government versions of Google Apps. Users of the Standard edition and of consumer services such as Google Docs and Gmail will have access “in the coming months,” Feigenbaum said, although he declined to say whether that would be before year-end. Users who repeatedly log in from the same machine—their home computer, for example—can choose to “Remember verification for this computer.” That will set a cookie on the machine instructing Google’s servers not to request the authentication code. That reduces security protection if the machine is stolen, said Feigenbaum, but “If someone has physical access to your machine, you have bigger problems to worry about,” he said. Google began work on Authenticator almost 18 months ago. The company’s staff have all been using it internally for the last three months, Feigenbaum said. That testing allowed them to optimize features such as the code length, he said.